Photo: Dan Cavallari | VeloNews.com (File). I enjoyed your article on the friction losses in 1x and 2x drivetrains. I have a related question. I have 50/34 chainrings and an 11/36 11-speed cassette on a road bike. The 50/36 gear is very close in ratio to the 34/25 gear: 1.388 vs 1.36. I have always wondered if the cross-chain friction loss from being in the 50/36 is greater than the link articulation loss from being in the 34/25. Obviously, the 50/36 benefits from reduced link articulation but suffers a significant cross-chain loss, whereas the reverse is true with the 34/25. Can you give me any help on this? I think that is already answered in the data I have included in the article (it’s in the VeloNews Gear Guide). If you look at the graph, notice that each one of those little red, green or blue solid circles has the rear cog and front chainring corresponding to that data point written into it, in white. I know the print is quite small, and for somebody of my age, it certainly requires reading glasses. In any case, notice that that the 53×34 combination consumes more energy than the nearly equivalent gear ratio of 39×25. And even the lower chain angles to the 53×30, 53×27 and 53×25 create higher friction than the 39×25. So, I think that, by extension, one can be fairly confident that with 50/34 chainrings and an 11-36 cassette, the 53×36 combination would consume more energy than would the 34×25 — the cross-chaining drag would trump the chain-articulation drag. We’d have to actually run the test to know for sure. With all the hype around gravel bikes, I’m wondering what are the differences between a gravel bike and a cyclocross bike? Good question! The difference primarily comes down to gearing, wide tire clearance, bottom bracket drop, and cable routing will also tend to differ. A cyclocross bike has a narrower gear range than a gravel bike. Other than the bikes of the fastest European pros (who need a higher gear for the opening sprint to the holeshot), a 1X drivetrain with a 40T chainring or so in the front coupled to an 11-32 cassette in the back covers it for most cyclocross courses. In cyclocross, the really steep hills are short and often too steep or slippery to ride anyway; a lower gear than 40×32 would add weight but not speed. A gear higher than 40 X 11 is rarely needed, as the tight turns and high tire rolling resistance rarely allow building any more speed than that. By contrast, a gravel bike will be expected to grind up long climbs, so a low gear close to one-to-one will often come in handy. And, a gravel bike will often find itself on long, fast, paved descents, so a much higher gear of at least 50×11 is needed. 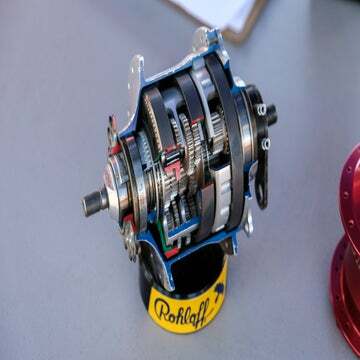 Look for gears on a gravel bike of 50/34 in front and 11-34 or 11-36 in the rear. Another detail difference may be tire clearance. A cyclocross bike is limited by UCI rules to a maximum tire size of 700x33C, and a C-shaped measuring tool is used in UCI races to ensure that no tire in the race is wider than 33mm. While abundant mud clearance around the tires is a must in cyclocross, that can also be required on a gravel bike. The gravel bike, however, must have considerably more tire clearance than a cyclocross bike, as it would be expected to fit at least up to 700x42C and likely 700x45C tires (and provide mud clearance around them). A few other details often differ as well. A gravel bike’s tires might be 10mm taller than those on a cyclocross bike, yet cornering clearance requirements are similar. 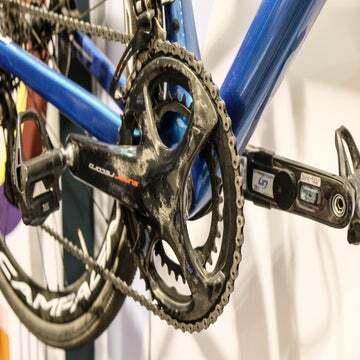 So, in order to have the bottom bracket height of the aired-up bikes end up being close to the same, the gravel-bike frame will generally have around 10mm more bottom bracket drop (the vertical distance between the center of the bottom bracket and the line connecting the centers of the front and rear hubs) than will the cyclocross frame. Cable routing for a front derailleur might be lacking on a cyclocross frame, whereas it would likely be present on a gravel-bike frame. 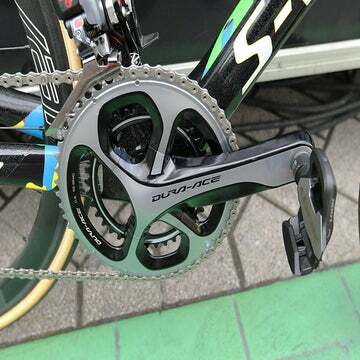 I believe SRAM changed the roller diameter on AXS chains, making it incompatible with all other 12-speed cassettes. And you also can’t use an 11-speed crankset, I would guess. On the subject of anticoagulants vs. Watchman.